Over 60 different Serious Sam 3 mods are available via the Steam Workshop. 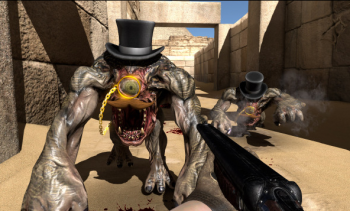 If you've ever wanted to put a monocle and top hat on every living gnaar in Serious Sam 3, then Steam has a mod for you. Over 60 different mods in fact, with more to come, as Steam has opened up its Workshop to fans of the iconic shooter remake. The full list can be found here. The mods cover a wide range of kit, from cardboard boxes to put over the harpies' heads, to the aforementioned Sir Buttersworth monocle mod. If maps are more your thing you can play in Venice and the North Pole, as well as other locales, should you so choose. The Workshop is Steam's way of getting user-generated content out to players, and Serious Sam 3 is one of the latest to get the treatment. The Workshop recently celebrated its first birthday. Workshop support comes courtesy of the October 31st Serious Sam 3 update. For more information on how to access or create these mods, look here.